System Maintenance Schedule: Maintenance is performed on Wednesdays and Sundays between 6:00 PM – 12:00 AM Hawaii Time. Online Banking may be unavailable intermittently during this time. Please arrange to submit transactions before or after this scheduled maintenance. Thank you for your understanding. Tablet users will now get the latest features and enhancements as Mobile Banking App users like biometric sign-in, include Apple Touch ID, Apple Face ID and Android fingerprint login, Instant Balance and Scheduled Transfers. If you are a current tablet App user, please delete the current App from your tablet and install the Territorial Savings Bank Phone App from the App Store. On Tuesday, October 9, 2018, the alerts feature in Consumer Online Banking will be replaced with a new alert service that has more alert options, easier to use, with alerts delivered to you in real-time. 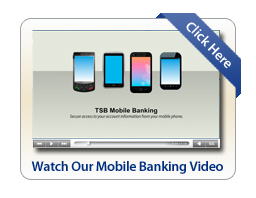 The new alert service will also be available for Mobile Banking customers. To provide you with this new service, existing alerts you may have scheduled will be cancelled on Tuesday, October 9. The last alert you will receive from the current alert service will be on October 9 at 10 am HST. We apologize for the inconvenience and hope you’ll try out the new and improved alert service.